When I first started working, I was very interested in learning about the Linux kernel. Specifically the TCP/IP stack and the inner workings of an Ethernet controller. To learn more, I picked one of the most widely used Ethernet controllers at that time, the Intel 82559 10/100 Fast Ethernet Controller and one of its open-source drivers, the eepro100. Thought 82559 chip is no longer manufactured and the eepro driver has been deprecated, this article will still serve as a guide for how an ethernet controller works. We’ll look at how the eepro100 driver interfaces with the Intel 82559 chipset and how the 82559 converts the packets sent by the driver to signals transmitted over physical ethernet cable. The 82559 is an Intel ethernet chipset. It supports 10/100 Mbps full duplex data communication over a pair of wires. This is a high level block diagram of the 82559. A parallel subsystem (shown in green). A FIFO subsystem (shown in red). The 10/100 Mbps Carrier Sense Multiple Access with Collision Detect (CSMA/CD) unit (shown in blue). The 10/100 Mbps physical layer (PHY) unit (shown in black). The parallel subsystem is responsible for interfacing the chipset with the motherboard via the PCI bus. It also controls and executes all the chipset’s functions via a Micro-Machine. As a PCI target (slave mode). In slave mode, 82559 is completely controlled by the host CPU. The CPU initiates all transmit and receive actions when 82559 is in slave mode. For processing the transmit and receive frames, the 82559 operates as a master on the PCI bus. It needs no help from the host CPU to read/write memory or other resources and can work independently. Command Unit (CU). The CU is also the transmit unit. These two units operate independently and concurrently. Control is switched between the two units according to the microcode instruction flow. The independence of the Receive and Command units in the micromachine allows the 82559 to execute commands and receive incoming frames simultaneously, with no real-time CPU intervention. The 82559 also interfaces with an external Flash memory and an external serial EEPROM. The Flash memory may be used for remote boot functions, network statistics, diagnostics and management functions. The EEPROM is used to store relevant information for a LAN connection such as node address (MAC Address), as well as board manufacturing and configuration information. The 82559 FIFO (First In, First Out) subsystem consists of a 3 Kbyte transmit FIFO and 3 Kbyte receive FIFO. Each FIFO is unidirectional and independent of the other. The FIFO subsystem serves as the interface between the 82559 parallel side and the serial CSMA/CD unit. It provides a temporary buffer storage area for frames as they are either being received or transmitted by the 82559. 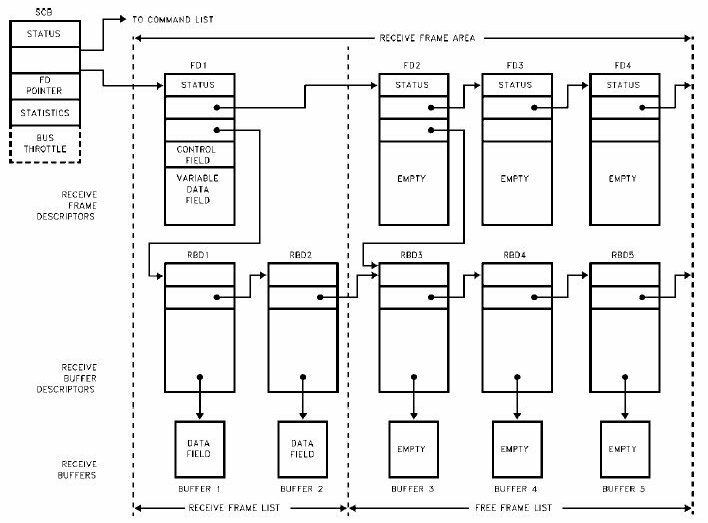 Transmit frames can be queued within the transmit FIFO, allowing back-to-back transmission within the minimum Interframe Spacing (IFS). Transmissions resulting in errors (collision detection or data underruns) are re-transmitted directly from the 82559 FIFO eliminating the need to re-access this data from the host system. The CSMA/CD unit of the 82559 allows it to be connected to either a 10 or 100 Mbps Ethernet network. The CSMA/CD unit performs all of the functions of the 802.3 protocol such as frame formatting, frame stripping, collision handling, deferral to link traffic, etc. The CSMA/CD unit can also be placed in a full duplex mode which allows simultaneous transmission and reception of frames. The Physical Layer (PHY) unit of the 82559 is where the digital data is converted to a signal that can propagate over the network wires. To make the actual connection to the network, additional components such as transformers and impedances are needed. This additional components are external to 82559. A PCI peripheral boards can be accessed using three different address spaces: memory locations, I/O ports, and configuration registers. The memory and I/O port address space is shared by all devices on a PCI bus (i.e., when you access a memory location, all the devices see the bus cycle at the same time). A driver can read memory and I/O regions via inb, readb, and so forth. The configuration space, on the other hand, exploits geographical addressing. i.e. each PCI slot is uniquely addressed (by a 16 bit address), thus eliminating collisions when configuring devices. To access the configuration space of 82559, the full configuration address (bus, slot, function, offset) is written to an I/O port (for 82559, CONFIG_ADDRESS = 0xCF8) and then the 32-bit word at this address can be read or written through another location (for 82559, CONFIG_DATA = 0xCFC ). After a PCI device is powered on, the hardware remains in an inactive state and the will only respond to configuration transactions. This is because, at power on, the device does not have its memory and I/O ports mapped into the computer’s address space. Every other device-specific feature, such as interrupt reporting, is disabled as well. After power on, the BIOS must first scan the PCI bus to determine what PCI device exists and what configuration requirements they have. In order to facilitate this process, all PCI devices, including 82559, must implement a base set of configuration registers as defined by the PCe standard. Registers defined by 82559 is shown in the figure below. The BIOS reads the Vendor ID, Device ID and Class registers in order to detect the device and its type. 82559 being an Intel device, returns a hard-coded 8086H for Device ID. Memory & IO Mapping the 82559 device. Having detected 82559, the BIOS then accesses 82559’s base address configuration registers to determine how many blocks of memory and/or IO space the device requires. 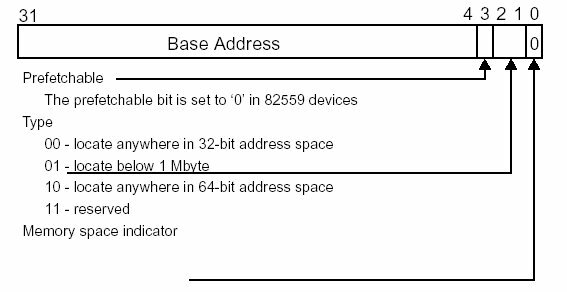 Base Address Register (BAR) is 32 bits wide and there can be upto 6 BARs per device. 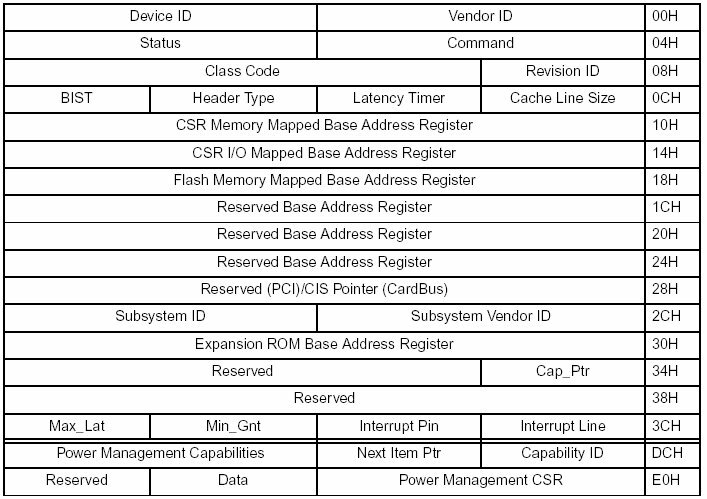 82559 defines 3 types of BARs, the Control/Status Registers (CSR), Flash, and Expansion ROM as shown in figure above. Bit zero in all base registers is read only and is used to determine whether the register maps into memory (0) or I/O space (1). Figure above shows the layout of a BAR for memory mapping. The 82559 contains three BARs, two requesting memory mapped resources and one requesting IO mapping. Specifically, Control and Status Register (CSR) is both Memory Mapped (CSR Memory mapped base address register: 10H) and IO mapped (CSR I/O Mapped Base Address Register: 14H) to anywhere within the 32-bit memory address space. It is up to the driver (eepro100) to determine which BAR (I/O or Memory) to use to access the 82559 Control/Status registers. The size of the memory space is 4Kb and that of I/O space is 32 bytes. The 82559 also requires one BAR (Flash Memory Mapped Base Address Register: 18H) to map accesses to an optional FLASH memory. After determining the types of mapping and amount of memory/IO space requested from the BARs, BIOS maps the I/O and memory controllers into available memory locations and proceeds with system boot. As described above, for Intel based systems, the system BIOS which ran at boot time has already fully configured the PCI system. This leaves Linux kernel with little to do other than remap that configuration. The PCI device driver (pci.c) starts by scanning PCI Buses and creates a pci_dev for every device (including PCI-to-PCI bridges) and pci_bus for every bus it finds. These structures are linked together into a tree that mimics the actual PCI topology. At this stage, the BIOS has recognized the 82559 and configured its PCI configuration space assigning it unique memory and IO space and the Linux kernel has created a pci_dev data structure defining 82559. When the eepro100 driver module is loaded into the kernel, the driver registers itself as a PCI driver by calling pci_register_driver(). Implicitly passed to pci_register_driver() is a table of all supported devices (eepro100_pci_tbl). This table lists all the chipsets this driver is capable of driving: 82557, 82558, 82559, 82801, etc. After registering the driver, pci_register_driver() probes [pci_device_probe()] the PCI device tree for all unclaimed PCI devices. Chances are that one of those devices could be an eepro100 compatible device. When an unclaimed device is found, pci_bus_match() and pci_match_device() are called to check if this unclaimed device is an eepro100 compliant PCI device. pci_match_device() checks if the PCI_VENDOR_ID, PCI_DEVICE_ID, PCI_SUBVENDOR_ID, PCI_SUBDEVICE_ID from the eepro100_pci_tbl and the device configure header values match (see 82559 configuration space figure above). If a match is found, eepro100’s probe function, eepro100_init_one(), is called to reset/probe the new device. After the probe is complete, the device is marked as claimed by eepro100. pci_find_capability(): Every device that supports PCI power management, including 82559, has an 8 byte capability field in its PCI configuration space (See address DCh – Eoh in the figure above). This field is used to describe and control the standard PCI power management features. The PCI PM spec defines 4 operating states for devices, D0 – D3. The higher the number, less power the device consumes but longer is the latency for the device to return to the operational state (D0). 82559 supports all 4 power states. pci_enable_device() (via pci_set_power_state()) activates 82559 by switching it to the D0 state. pci_set_master(): If the device has bus mastering capability, during bootup the BIOS can read two of its configuration registers (Minimum Grant register: Min_Gnt and Maximum Latency register: Max_Lat, see configuration registers in the above figure) to determine how quickly it requires access to the PCI bus when it asserts REQ# pin and the average duration of its transfer when it has acquired ownership of the bus. The BIOS can utilize this information to program the bus master’s latency timer register and the PCI bus arbiter to provide the optimum PCI bus utilization. For 82559, the default value of Minimum Grant Register is 08H and Maximum Latency Register is 18H. pci_set_master() is called to enable 82559 to act as a bus master. During boot, the BIOS had allocated a range of unique memory and IO regions for accessing 82559’s configuration space. For the driver to use these regions, they have to be reserved and locked in the kernel by marking those regions as BUSY (to prevent other drivers from accessing these same regions). eepro100_init_one() locks the PCI BIOS assigned IO port regions using request_region() (cat /proc/ioports to see a list of all locked IO ports). Similarly to reserve memory mapped regions request_mem_region() is called. This is done for all the 3 regions pointed to by the 3 active 82559 BARs. The 82559 is now physically enabled and is ready to start receiving and transmitting ethernet frames. The driver now prepares the kernel to start using this device for network access via speedo_found1(). 690         /* Read the station address EEPROM before doing the reset. 692            then we wouldn't have a device name with which to report the error. 693            The size test is for 6 bit vs. 8 bit address serial EEPROMs. 723                         printk(KERN_WARNING "%s: Invalid EEPROM checksum %#4.4x, "
727                    usable, especially if the MAC address is set later. 731         /* Reset the chip: stop Tx and Rx processes and clear counters. 766                         printk(KERN_INFO "  Receiver lock-up bug exists -- enabling"
768                 printk(KERN_INFO "  Board assembly %4.4x%2.2x-%3.3d, Physical"
807                         printk(KERN_ERR "Self test failed, status %8.8x:\n"
808                                    KERN_ERR " Failure to initialize the i82557.\n"
809                                    KERN_ERR " Verify that the card is a bus-master"
813                         printk(KERN_INFO "  General self-test: %s.\n"
814                                    KERN_INFO "  Serial sub-system self-test: %s.\n"
815                                    KERN_INFO "  Internal registers self-test: %s.\n"
speedo_found1(): The kernel needs to know that this is an Ethernet device and it can use this new PCI device to send/receive data over the network. For this, a device specific structure, net_device, is create and registered register_netdevice() with the kernel. net_device contains the device name, it’s MAC address, options like full-duplex, interrupt number (IRQ) & pointers to functions for executing all the device functions. Every ethernet device found should have a unique name and on linux, ethernet devices are named eth0, eth1…eth100. dev_alloc_name() allocates a name for this device and sets it in net_device structure. Every 802.3 device has an unique 48-bit MAC address assigned to it. This address is not hardcoded in 82559, but is stored by the board manufacturer in a non-volatile form, such as in the EEPROM or Flash EPROM outside 82559. 82559 expects the EEPROM format to be as shown below. The 82559 automatically reads five words (0H, 1H, 2H, AH, and DH) from the EEPROM during bootup. The MAC address is extracted from 0H, 1H & 2H. The rest of the EEPROM map contains device options like type of connector, the device type, PHY device ID etc. speedo_found1() then proceeds to reset the 82559 chip using the PORT command (writing a zero value to the SCBport, offset 8 in the CSR). The PORT commands is also used to self-test the 82559. The kernel also needs to know what functions to call to open the device (speedo_open), transmit (speedo_start_xmit), close/stop (speedo_stop), get stats (speedo_get_stats), do IOCTL (speedo_ioctl). Notice that there is no receive function. This is because packets are received asynchronously. When a new packet is received 82559 interrupts the kernel and the interrupt service routine handles the received packet (more on this later). At this point the timer routines are also initialized. This completes the initialization of 82559. The device is now ready to receive & transmitt ethernet frames. After initializing the device, the device should be opened so that it is accessible from the IP layer. The device is accessible from the outside world when an IP address is assigned to it. One way to assign an IP address to an interface is throught the ifconfig program available from the net-utils. When asked to bring up the eth0 interface, ifconfig creates a generic raw TCP socket to the afinet address family and issues a SIOCSIFFLAG ioctl to this raw socket. The flags set on the interface are the IFF_UP & IFF_RUNNING. The userspace ioctl() system call is transformed to the inet_ioctl() defined in af_inet.c. For ifconfig (or any interface-type ioctls) inet_ioctl() calls devinet_ioctl() function. 498                    so that we do not impose a lock. 539                            and only if the original address family was AF_INET. 655                          *      The mask we set must be legal. devinet_ioctl() fetches the user space defined ifreq structure containing the name of our interface and the IP address to the kernel space. Based on the name of the interface (eth0, for e.g. ), the device structure, net_device (remember we created this in speedo_found1() above? ), is looked up [*__dev_get_by_name()* ]. The IP is set to this device by *inet_set_ifa()*. After initialization, 82559 is ready for its normal operation. As a Fast Ethernet Controller, its normal operation is to transmit and receive data packets. 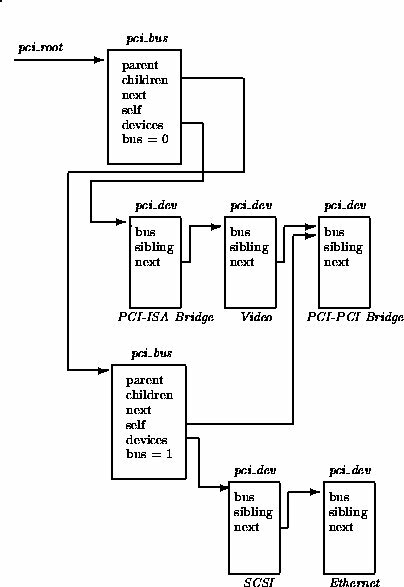 As a PCI bus master device, 82559 works independently, without CPU intervention. The CPU provides the 82559 with action commands and pointers to the data buffers that reside in host main memory. The 82559 independently manages these structures and initiates burst memory cycles to transfer data to and from main memory. The Receive Frame Area (RFA). The CSR resides on-chip and can be accessed by either I/O or memory cycles (after the PCI BIOS has mapped this region to a region accessible by the CPU. See the section PCI Kernel Initialization), while the CBL and RFA reside in system (host) memory. Command Block List (CBL) is a linked list of commands to be executed by 82559. Receive Frame Area (RFA) is a linked list of data structures that holds the received packets (frames). The 82559 has seven Control/Status registers which make up the CSR space. The first 8 bytes of the CSR is called the System Control Block (SCB). The SCB serves as a central communication point for exchanging control and status information between the host CPU and the 82559. The CPU instructs the 82559 to Activate, Suspend, Resume or Idle the Command Unit (CU) or Receive Unit (RU) by placing the appropriate control command in the CU or RU control field of SCB. Activating the CU causes the 82559 to begin transmitting packets. When transmission is completed, the 82559 updates the SCB with the CU status then interrupts the CPU, if configured to do so. Activating the RU causes the 82559 to go into the READY state for frame reception. When a frame is received the RU updates the SCB with the RU status and interrupts the CPU. Transmit or configure commands issued by CPU are wrapped inside what are called Command Blocks (CB). These command blocks are chained together to form the CBL. Non-Tx commands: This category includes commands such as NOP, Configure, IA Setup, Multicast Setup, Dump and Diagnose. Tx command: This command causes the 82559 to transmit a frame. A transmit command block contains (in the parameter field) the destination address, length of the transmitted frame and a pointer to buffer area in memory containing the data portion of the frame. 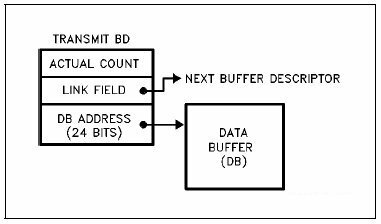 The data field is contained in a memory data structure consisting of a buffer descriptor (BD) and a data buffer, or a linked list of buffer descriptors and buffers (as shown in figure below). When eepro100 is ready to transmit a packet, it must create this Tx command block and send it to 82559. This Tx Command block is a structure called TxFD (Transmit Frame Descriptor). This TxFD can hold one TxCB and two Tx Buffer Descriptors (TxBD). During eepro100 initialization (speedo_found1()), a fixed number of these TxFD’s are created and linked together into a ring (tx_ring_space). When new data is available for transmission, one of the TxFD is fetched from the ring and sent to 82559 for transmission. To reduce CPU overhead, the 82559 is designed to receive frames without CPU supervision. 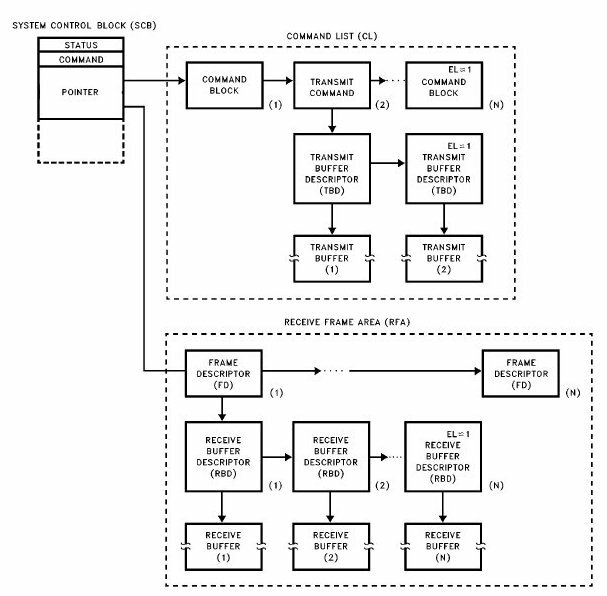 The host CPU first sets aside an adequate receive buffer space and then enables the 82559 Receive Unit (This is done in speedo_init_rx_ring when the device is opened: speedo_open). Once enabled, the RU watches for arriving frames and automatically stores them in the Receive Frame Area (RFA). The RFA contains Receive Frame Descriptors, Receive Buffer Descriptors, and Receive Buffers (see figure below). The individual Receive Frame Descriptors make up a Receive Descriptor List (RDL) used by the 82559 to store the destination and source addresses, the length field, and the status of each frame received. An application calls write(socket, data, length) system call to write to an open socket. In the kernel, inet_sendmsg() is executed with a pointer to the sock structure. inet_sendmsg() calls the send operation of the corresponding transport protocol which for TCP is tcp_sendmsg(). tcp_sendmsg() copies the data to be transmitted from the user space to the socket and starts the transmit process by calling tcp_send_skb() and subsequently tcp_transmitt_skb(). tcp_transmitt_skb() adds the TCP Header to the packet, calculate the TCP checksum and call the ip_queue_xmit(). Determining the ip route and construction of the IP header happens in ip_queue_xmit(). Finally the MAC address is copied to the packet and dev_queue_xmit() is called to send the packet to the ethernet device. dev_queue_xmit() points to a driver specific function. In case of eepro100, this function is speedo_start_xmit() (remember we set this in speedo_found1()?). 1487            command and resuming CU to be as small as possible. speedo_start_xmit() inserts any data received from the kernel (skb) into the Tx ring. If there are no open slots in the Tx ring, netif_stop_queue() is called to request the kernel to stop sending more packets from the upper layers and flag the Tx ring as full. The new skb (data) to be transmitted is inserted as the data portion of a TxFD at tx_buf_addr0 (See TxFD above). The TxFD status of this entry is set to CmdSuspend (suspend after completion), CmdTx and CmdFlex (flexible transmission mode). The last command inserted into the Tx ring has the CmdSuspend bit set so that the CU is suspended immediately after the last command is executed. This way we prevent any erroneous data from being transmitted. We have to clear the CmdSuspend from the previous command already in the Tx ring before doing this. If the Tx ring is more than half full, we also set CmdIntr (interrupt after completion). The causes the chip to generates an interrupt after executing this command. When an interrupt is received after transmit completes, the interrupt handler calls speedo_tx_buffer_gc() to clean up completed and erroneous skb from the Tx ring. Finally, we activate the CU to transmit this new packet by issuing CmdResume to SCB. 82559 automatically generates the preamble (alternating 1s and 0s) and start frame delimiter, fetches the destination address and length field from the Transmit command, inserts its unique MAC address (that it fetched from the external Flash/EEPROM) as the source address, fetches the data field specified by the Transmit command, and computes and appends the CRC to the end of the frame. This final frame is then handed over to the PHY layer for transmission over the wire. 82559 has an internal 82555 Physical Layer Interface (PHY). It is responsible for connecting the 82559 to the actual physical wire over which the data will be carried. PHY converts the incoming digital data to analog signals during transmission and analog signals to digital data during reception. All data transmitted and received over wire are synchronized with a clock. To keep the receiver in sync with the transmitter, the clock signals have to be embedded in the signal transmitted over the wire itself. The robustness of this digitally transmitted synchronization signal often depends on the statistical nature of the data being transmitted. For example, long strings of 0â€™s and 1â€™s can cause loss of the synchronization since the receiver clock is derived from the received data. Therefore, data must contain adequate transitions to assure that the timing recovery circuit at the receiver will stay in synchronization. Scrambling (randomizing) the data over a period of time spreads these patterns. There are different ways to represent the digital 1 & 0 over the wire. The most widely used is Non-Return to Zero (NRZI) format. NRZI, is a two level unipolar code (0 and V) representing a “one” by a transition between two levels and a “zero” is represented by no transition as shown in the figure below. Another format is MLT-3. MLT-3 is a three level eenting a “one” by a transition between two levels and “zero” as no transition as shown in figure below. MLT-3 has the advantage that the maximum fundamental frequency of MLT-3 is one-half that of NRZI. With the MLT-3 coding scheme, 90% of the spectral energy is below 40MHz versus 70MHz for NRZI. Thus we can achieves the same data rate as NRZI, but do not require a wideband transmission medium. 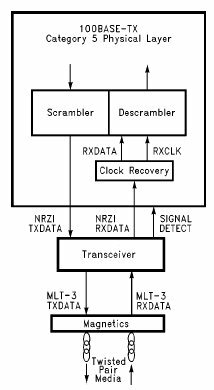 The work of the encoder/decoder is to convert between NRZI and MLT-3. Finally, the MLT-3 encoded data is transmitted over the wire. It is important to isolate the the PHY from the CAT-5 Ethernet cable for load balancing and also feedback. This is done by using specialized Ethernet magnetics with each side of the transformer referenced to the appropriate ground. Once the PHY detects signals on the receive side, it decodes and descrambles it to reconstruct the data transmitted by the receiver. To reduce CPU overhead, the 82559 is designed to receive frames without CPU supervision. The eepro100 had already setup the address of the receive buffer ring in the SCB as part of initialization. Once the 82559 receive unit (RU) is enabled, the RU watches for arriving frames and automatically stores them in the Rx ring / Receive Frame Area (RFA). The RFA contains Receive Frame Descriptors, Receive Buffer Descriptors, and Data Buffers (see Figure 2). The individual Receive Frame Descriptors make up a Receive Descriptor List (RDL) used by the 82559 to store the destination and source addresses, the length field, and the status of each frame received. 82559 checks each passing frame for an address match. The 82559 will recognize its own unique address, one or more multicast addresses, or the broadcast address. If a match is found, 82559 stores the destination address, source addresses and the length field in the next available Receive Frame Descriptor (RFD). It then begins filling the next available Data Buffer on the Receive Buffer Descriptor (RBD). As one Data Buffer is filled, the 82559 automatically fetches the next Data Buffer & RBD until the entire frame is received. Once the entire frame is received without error, a frame received interrupt status bit is posted in the SCB and an interrupt is sent to the CPU. The interrupt handler (speedo_interrupt()) checks if the receive interrupt bit is set in SCB and calls speedo_rx() to handle the received packet. 1800                                 printk(KERN_ERR "%s: Ethernet frame overran the Rx buffer, "
1805                                 printk(KERN_ERR "%s: Anomalous event in speedo_rx(), "
1853                 /* Refill the recently taken buffers. The receive is a very simple process as most of the work is handled by the 82559 chip. 82559 while storing the packet on the Rx ring has already determined the size of the packet, it stores this along with other relevent information like the receive status in the Rx buffer. speedo_rx() checks the status to make sure there were no errors in receiving the frame. The driver receives packets into full-sized buffers – 1560 bytes. When a packet comes in, the driver needs to make a decision. Does it use the whole 1560 bytes for this packet, or does it allocate a smaller buffer on-the-fly and copy the data into it? If the size of the frame received is smaller than the rx_copybreak, then a new buffer is allocated and the data is copied into it. If the packet is larger than rx_copybreak, we remove the received skbuff (leaving a hole in the Rx ring) and pass this buffer to the higher applications. We later call speedo_refill_rx_buffers() to refill the hole in the Rx ring. The type of protocol of this packet is determined by calling eth_type_trans(). The packet is then queued for the upper layers to process using the netif_rx(). Finally we refill the buffer we just took out of the Rx ring.